This became our mantra and our motto. At every meal, at every landmark, at every spectacular tour, someone in our group of 10 would sing out those words and the rest of us would follow. 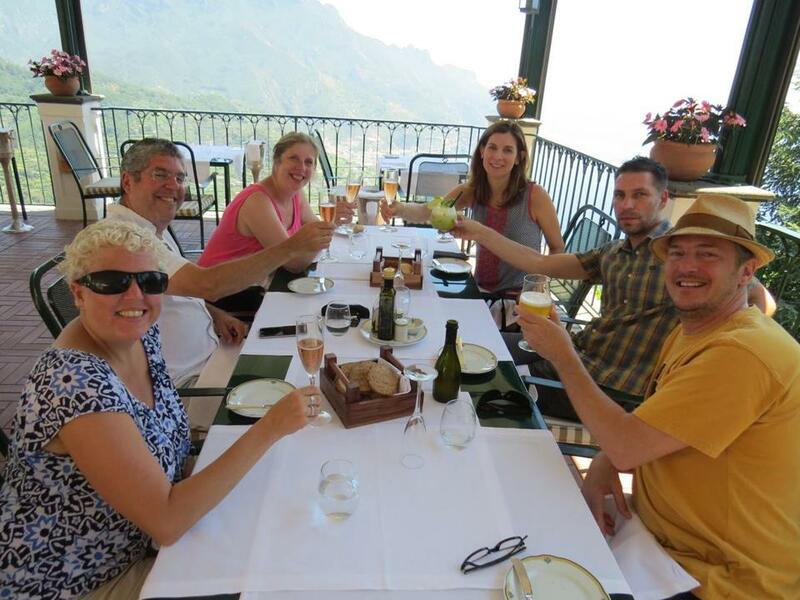 It only made sense as we three families were in Italy to celebrate a significant milestone birthday for Sarah (never mind which one!). Sarah’s family of four, consisting of her husband and two teenagers (one girl and one boy); my family of three, with one teenage daughter; and one other couple, with their teenage son, have been friends since before our kids were born. We’ve spent countless summer vacations on Martha’s Vineyard, our kids have had too many sleepovers to count, we’ve celebrated New Year’s Eve and other holidays as a group, but all 10 of us had never traveled out of the country for two weeks together. When Sarah asked if we’d consider it, we all quickly agreed. That was the easy part. We successfully navigated a trip with six very opinionated adults and four equally opinionated teenagers. Here’s what we learned and what anyone thinking about taking a similar trip should consider. Originally Sarah wanted to go to Spain, but that was soon abandoned and we settled on Italy. That’s where it first got complicated. Most of the adults have had varying experience with travel in Italy and we all wanted to go somewhere none of us had been before. By a long, and somewhat tedious elimination process, we settled on Sorrento. Ultimately, we let Sarah make the final decision since the trip was for her and everyone was happy with the choice. A second component in planning was that Sarah also wanted to go to Rome for a few days, as no one in her family had been. My family decided to join hers and that set up another round of plans to organize. Separate bedrooms. A swimming pool. Internet. Those were the first things to come up as requirements, but after that, we drifted into vague territory. How far from town did we want to be? Did the décor really matter that much? And most importantly, how much was each family willing to pay? Each of these things was important to all of us on a different scale, so we had to negotiate as we planned. There was one night where we were gathered at one family’s house and all the adults had laptops and iPads out looking at houses and making a pitch for our favorites. We had agreed in advance we wanted to get a house through Airbnb, so we’d have plenty of room, while also keeping the costs reasonable. The teens wanted a pool, the Internet, and their own rooms. 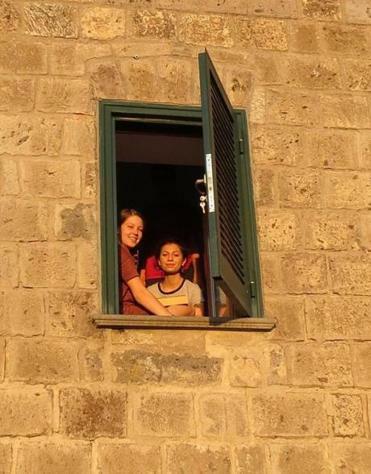 In the end, however, the two girls happily shared a room in Sorrento and in Rome. As the travel “expert” in our group, I was tasked with planning at least part of our itinerary. After asking everyone for a wish list of sights and activities, I started researching. With a group as large as ours and with having to travel in the summer to accommodate the kids’ schedules, I thought some guided tours would be best. Italy can be jammed with tourists during the high season and hiring a private guide would be both cost-effective and help us navigate the sights in an efficient way. Pompeii topped the list, and I worked with a company called “Discover Your Italy” to set up a day trip from our house in Sorrento, complete with a driver and a guide. We also hired the company for a walking tour of Rome, which included visits to the Vatican, the Forum, the Colosseum, and the Palazzo Valentini museum. This was one of our best decisions. Our guides were locals who spoke excellent English and were well-versed in their subject matter. And, happily, as part of the service, they procured VIP tickets, which meant we never stood in the immense entrance lines that we saw everywhere. I did fall down on the job by neglecting to book a boat trip to Capri, which we had discussed at one point. But we asked the owners of the Airbnb for help and they hooked us up with a local company that had a boat and captain. This proved to be one of the absolute highlights of the trip, so planning everything to the last detail can be over-rated. Spontaneity can be rewarding. Even in my small family of three, we need to get away from each other every now and then. There is no way 10 people can agree on everything to do, eat, and visit. We did our best to build in time for everyone to take a break from the group or to divide into smaller groups. One evening was a perfect example. I’m a sucker for food tours, so in any new city I visit, I look for one. When we were in Rome, I signed the adults up for an “Eating Italy: Twilight Trastevere” tour in Rome. We didn’t think the teens were up for a four-hour food tour, especially as this was nearing the end of our trip, so we cut them loose. Obviously, how much freedom you give your children depends on a number of factors, but since everyone was at 17, or close to it, we felt OK about it. We adults had a blast exploring and tasting our way through the charming neighborhood, and we brought treats back to the apartment for the kids. They, in turn, regaled us with their tales of exploring part of Rome on their own. A win-win for everyone. In a moment of vacation exuberance, one of our party ordered two cases of the wine we were sampling at Sorrentino Winery to be shipped home. As it was ordered, we made a pact to get together when it arrived. We’d have a reunion potluck with each family bringing their favorite Italian dish, and we’d toast our adventures once more. When it arrived almost two months later, we did just that, and once again as we raised our glasses, we said, “Happy birthday, Sarah!” Then we started planning our next trip.